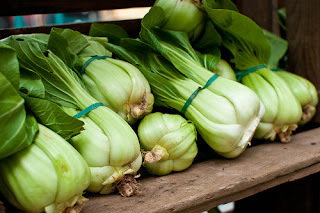 Anktangle: Farm Fresh: Bok Choy! I decided to take advantage of the abundance of the Summer growing season by featuring a new unusual vegetable each week. These vegetables may be ones you've had before, or ones you've heard of but never dared to taste. Or, they may be ones you had no idea how to prepare to eat. I'll include a bit of information about the vegetable, a simple recipe, and a linky so you can share your favorite recipe featuring the vegetable of the week. The link collections will be open for a full month after I feature a vegetable, so you can experiment with it and then come back here and link up your successes. The series will run through the end of August. (Next Friday will be the last one!) So far, I've featured artichoke, kale, eggplant, beet, zucchini, kohlrabi, fennel and this week, bok choy! If there's a vegetable you'd like to see featured in the series, or if you have a preparation tip to add, please let me know in the comments. And don't forget to link up your bok choy recipes in the linky below! I chose bok choy for this week's featured vegetable because I used to be afraid of it. To be honest though...I really just didn't know what it was. I had heard the name and also seen the vegetable at the market, but I never knew that they went together. We got some bok choy in our CSA delivery box (back when we had that a few years ago) and I had to look it up to figure out what it was. Turns out, it's just a kind of cabbage...not scary at all! It's easy to cook and rather versatile to use in stir fry preparations. one of these sprouted ones. They were smallish, but definitely successful! So far in this series, I've used only vegetarian (and mostly vegan) recipes. However, I decided to modify this meaty bacon-y bok choy recipe to share this week. It's simple, easy, and quite tasty. Fry the bacon until it's crispy, then set aside. Remove some of the bacon grease from the pan (if there's a lot...there wasn't from my bacon, so I didn't bother) and add the onions and garlic. Cook over medium heat until the onions are tender. Add the bacon back in and stir until incorporated. Serve immediately! This bok choy preparation was delicious. We like to say around here that everything's better with bacon, and this was no exception. I can't wait to see what kind of bok choy recipes you come up with this week! How do you like to eat bok choy?